I have grown up in Reading and whilst the close proximity to London and journey time of 30 mins is great I am well aware of the peak time chaos on the journeys to and from London. I remember how often I have been standing in the vestibule en route to Paddington but luckily I have so far not had to make this journey daily. This peak time chaos has been the topic of an article in the Guardian and Daily Mirror which stated that London Paddington is the worst station for overcrowded trains in the London and South East. Of the ten most crowded trains 3 involved the Reading to Paddington route and to make matters worse the trains are also holding double their load capacity. Figures yesterday revealed the worst service for overcrowding is the 6.37am Reading to London Paddington where 610 standard class passengers squeeze into three carriages meant to hold 304. And on the evening return trip at 6.45pm, 588 commuters cram into the train. I do not yet see improvements to these services despite the risk to passengers’ safety and rising ticket prices. there is no penalty for the train companies for overcrowding, how about free tickets if the train is full and you are standing? In First Great Western’s case we have older trains too when is their rolling stock going to be changed- in the summer it is also very uncomfortable with no or poorly performing AC. 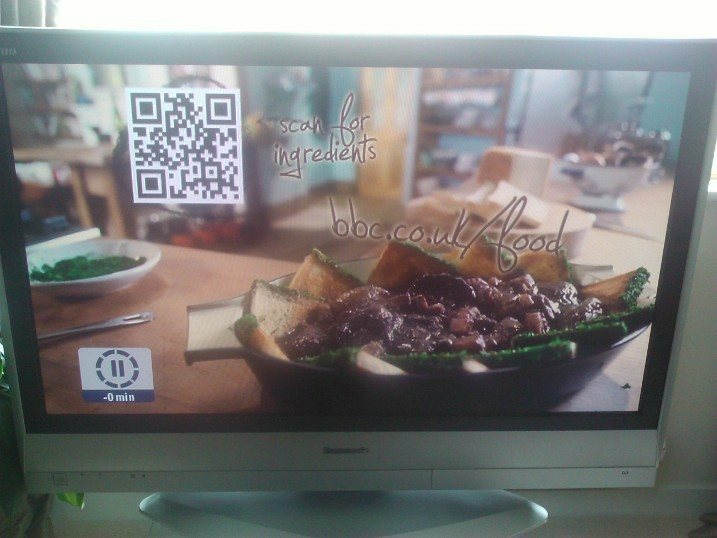 I also noticed a QR code on a food programme on BBC1 which takes you to the ingredients for the recipe that had just been cooked up. 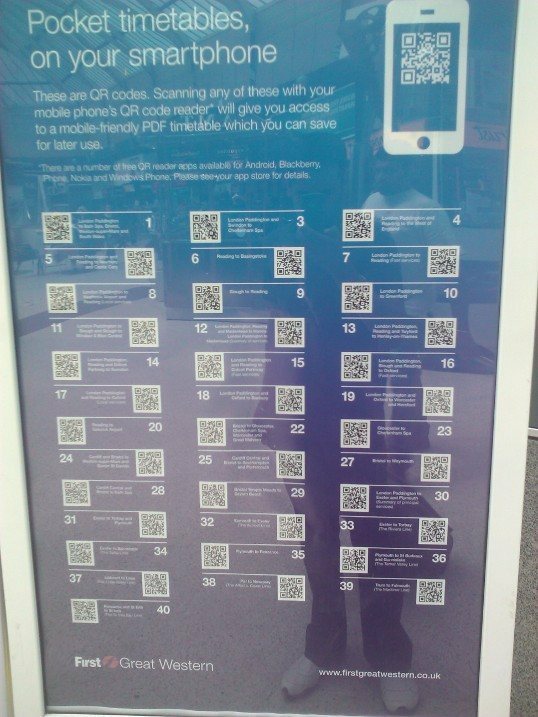 QR codes are clearly beginning to creep into our world slowly. QR codes are a great idea and they appear to be growing in popularity in the UK. You can scan a QR code using your mobile and this will take you to a webpage chosen by the creator of the code. A QR code (abbreviated from Quick Response code) is a specific matrix barcode (or two-dimensional code) that is readable by dedicated QR readers, smartphones, and to a less common extent, computers with webcams. The code consists of black modules arranged in a square pattern on a white background. The information encoded may be text, URL, or other data. I have been QR code spotting and yesterday I noticed that Betfair are placing QR codes on two beach volleyball players at the Olympic Test event. The QR code below takes the user to a registration page to join Betfair, offering consumers a free bet.